October 31st 1892; on this day, The Adventures of Sherlock Holmes, by Arthur Conan Doyle, is published. The book was the first collection of Holmes stories, which Conan Doyle had been publishing in magazines since 1887. Conan Doyle was born in Scotland and studied medicine at the University of Edinburgh, where he met Dr. Joseph Bell, a teacher with extraordinary deductive power. Bell partly inspired Doyle’s character Sherlock Holmes years later. After medical school, Conan Doyle moved to London, where his slow medical practice left him ample free time to write. His first Sherlock Holmes story, “A Study in Scarlet,” was published in Beeton’s Christmas Annual in 1887. Starting in 1891, a series of Holmes stories appeared in The Strand magazine, and Conan Doyle was able to give up his medical practice and devote himself to writing. 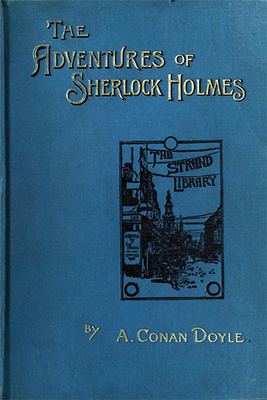 Later collections include The Memoirs of Sherlock Holmes (1894), The Return of Sherlock Holmes (1905), and The Casebook of Sherlock Holmes (1827). In 1902, Conan Doyle was knighted for his work with a field hospital in South Africa. In addition to dozens of Sherlock Holmes stories and several novels, Conan Doyle wrote history, pursued whaling, and engaged in many adventures and athletic endeavours. After his son died in World War I, Conan Doyle became a dedicated spiritualist. He died in 1930.